with Crane Kalman Gallery, London. with R.H. Lansdale Bonner of Bare, Morecombe, where purchased by the present owner in 1980. Exhibition catalogue, L.S. Lowry A selection of 36 Paintings, London, Crane Kalman Gallery, 1975, no. 25, illustrated. Edinburgh, Scottish Arts Council, Scottish Arts Council Gallery, L.S. Lowry, December 1977 - January 1978, no. 46: this exhibition travelled to Hawick, Wilton Lodge Museum, January - February 1978; Aberdeen, Art Gallery, February - March 1978; Dundee, Museum and Art Gallery, March - April 1978; Inverness, Museum and Art Gallery, April - May 1978 and Perth, Museum and Art Gallery, May - June 1978. London, Crane Kalman Gallery, L.S. Lowry A Selection of 36 Paintings, November - December 1975, no. 25. Painted in 1954, the subject matter of the Cumbrian coastal town, which is situated on the Solway estuary, appears in a number of works by Lowry, including Senhouse Street, Maryport, 1955 (sold in these rooms, 4 June 2004, lot 70, for £498,050). One of Lowry's connections with the town was through his friendship with the Reverend Geoffrey Bennett. The two had met in 1926 and when 'The Reverend Gentleman', as Lowry referred to him, moved with his family to Cumbria, Lowry became a frequent guest. 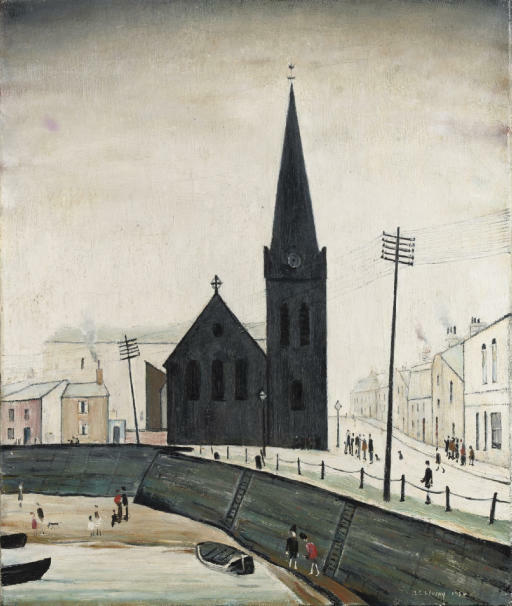 The composition of On the Quay, Maryport is dominated by a dark church which seems to loom over the small figures in the street and much of the rest of the canvas is painted with the flake white paint that Lowry favoured for streets, skies and often the colour of the sea. Lowry commented, 'When I started painting industrial scenes fifty years ago I painted them very dark. But when I showed them to Bernard Taylor, who was then art critic of the Manchester Guardian, he said: 'Now put them up against the wall', and of course they both looked equally black. I was very cross with him. Then I started painting crowds against a practically white ground, and he said, 'That's right, and you've lost nothing in quality'. And I had to agree with him' (see M. Leber and J. Sandling (eds. ), exhibition catalogue, L.S. Lowry, Salford Art Gallery, 1987, pp. 75-76). Lowry preferred the flake white paint as it will, as he put it 'go down', mellowing and ageing to produce the delicate spectrum of tones that are apparent in his paintings.